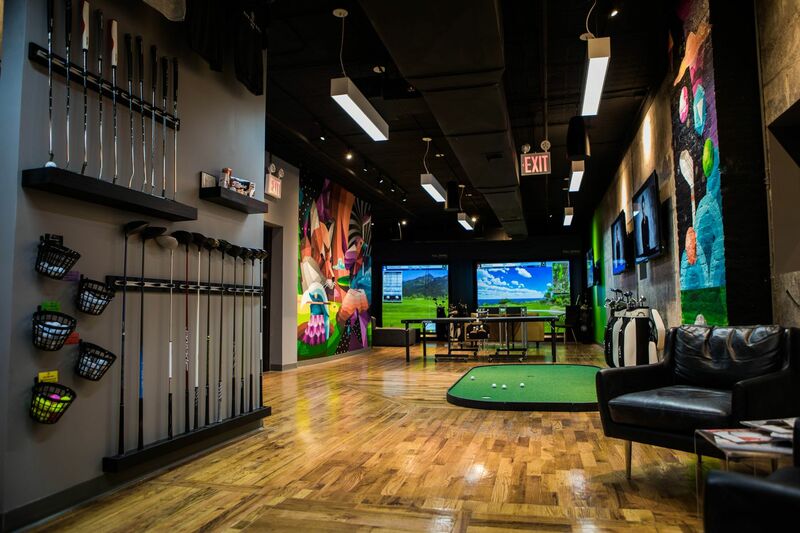 Five Iron Golf's New York locations include lounges and golf simulators. We have bowling, Ping Pong, and billiards in Center City. How about some more sports activity. Five Iron, an indoor golf venue with two locations in New York City, has a Philadelphia location teed up for a summertime opening at 2116 Chestnut St.
Co-owner Nora Dunnan, who grew up in New Hope, says the Center City location will have five to eight simulators, as well as a bar and food menu, Ping Pong, shuffleboard, and wide-screen TVs. Company lore says Five Iron started about four years ago when golf pro Mike Doyle was teaching simulator lessons in the back of a men’s clothing store in midtown Manhattan. He and his student Jared Solomon (an options trader and also originally from New Hope) came up with the idea of opening an indoor facility. Dunnan, a consultant, and Solomon’s wife, Katherine Solomon, a lawyer, got the business off the ground. The first location opened in mid-2017 at 19th Street and Fifth Avenue in Flatiron, and then expanded. A second location opened last year in the Financial District. Dunnan points out that the company grew from four simulators to 19 last year. Five Iron hosts golf leagues, corporate events, and bachelor parties.